According to Canadian officials, a 65-meter Japanese fishing boat that was lost more than a year ago in the tsunami, off the east coast of Japan, has been spotted 278 kilometers off the southern coast of Haida Gwaii islands, approximately 1,500 kilometers north of Vancouver. The “ghost ship” was spotted by a Canadian military air patrol, and it is believed that it has been adrift since March of the last year. “It looks fairly sound and has rust streak from being out there for a year,” said Marc Proulx, the maritime coordinator of the Joint Rescue Coordination Center in Victoria, British Columbia. Officials said that the vessel was stable and posed no danger. Nevertheless, since an unmanned vessel drifting alone at the sea is considered a navigation obstruction for vessels, mariners received a notice about the vessel’s presence. The Japan Coast Guard, after being provided by the Canadian officials with the identification number on the hull of the ship, managed to identify and contact the owner of the vessel. According to Japanese Coast Guard officials, the vessel was used for squid fishing and was moored at Hachinohe in the Aomori prefecture when the tsunami hit. The ship is being monitored for possible marine pollution by the Canadian agencies, although at the moment there are no reports of any spills from the ship. The Japanese fishing boat is not expected to reach landfall for another 50 days, even though most probably it will have been salvaged by then to avoid any possible navigational incidents. The fishing trawler is the first large piece of debris found after the earthquake and the consequent tsunami that hit Japan last year. According to the University of Hawaii, near Midway Atoll in the deep Pacific, a Russian ship has also spotted a Japanese boat, along with other debris such as a television and household appliances. Last year’s tsunami that hit Japan, caused a large scale discharge of debris into the ocean. Due to the disaster on land, at the time there was no way to control, capture or even track the debris flow through the ocean. Some debris may have been pushed back to the Japanese coastline, but most of the debris went into the open Pacific Ocean. It is not known exactly how much have sunk to the bottom, and how much are still floating. Large dense patches of floating debris are an immediate threat to maritime safety, including safety of fishery activities. Debris may shelter different species that are characteristic for the coastal waters of Japan and help them to survive a trans-Pacific voyage to the waters of the US West Coast and Hawaii. 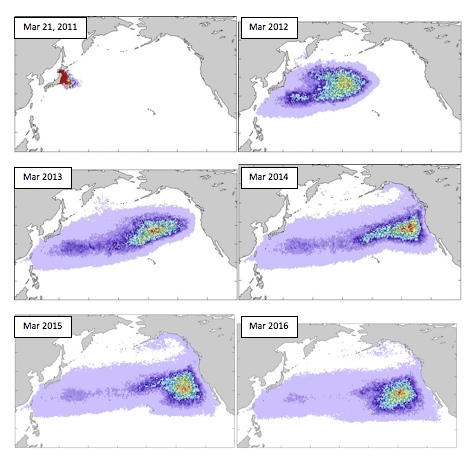 Tsunami debris may increase the amount of plastic and other material that has accumulated in the North Pacific, and may exaggerate its impact on the ecosystem throughout the ocean. Only models, based on existing knowledge of current flow, wind direction, and other oceanographic data, can help to estimate where the debris may be, and how it is moving across the Pacific. One such model (Maximenko et al., 2011) is shown in the figure below. The debris from Japan is expected to drift eastward and reach Midway Island in one year. About two years after, it may reach the US West Coast. Most of the debris plume will then re-circulate to the southeast, potentially reaching the convergence zone northeast of Hawaii called the North Pacific Gyre. If the material does not sink or biodegrade, it can remain in this area for many decades, potentially polluting Hawaiian beaches when storms or winds are strong enough to move some of the material from the convergence area to shore. U.S. NOAA has produced a video regarding tsunami marine debris. There is still a large amount of uncertainty over exactly what is still floating, where it’s located, where it will go, and when it will arrive.